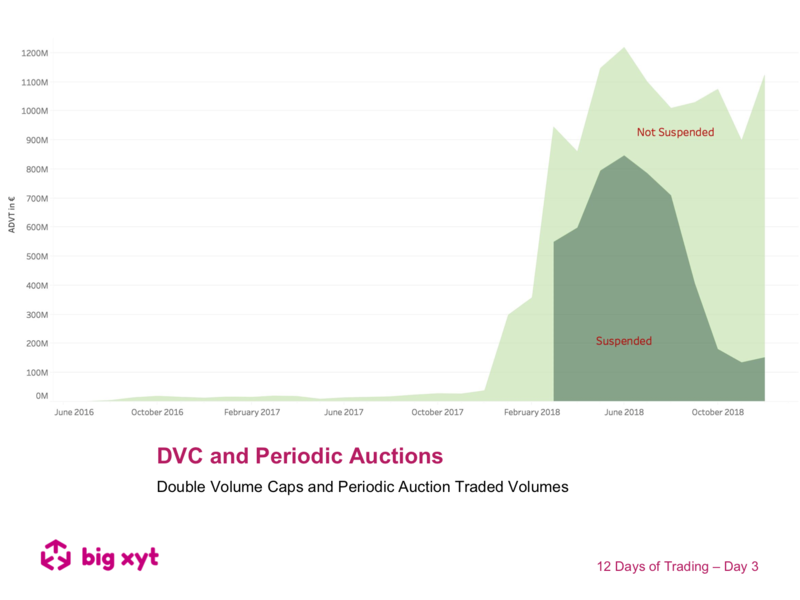 In our final view of the series we return to one of the most controversial MiFID II introductions, Double Volume Caps, with a different attempt to assess their impact by examining how UK blue chip volume dispersed before during and after DVC suspensions. 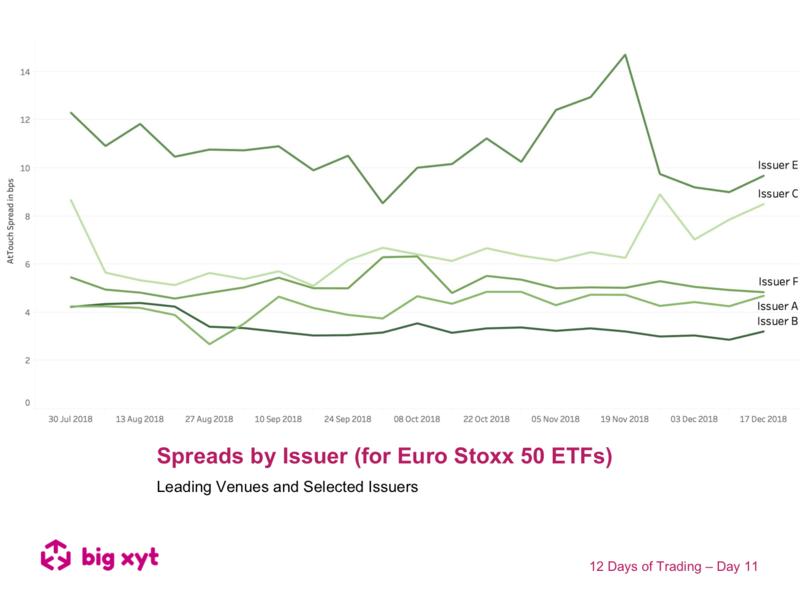 Another comparative way to look at ETF spreads is by issuer. For today’s review the issuer names are anonymised (issuers A to F), but consistent across both charts. 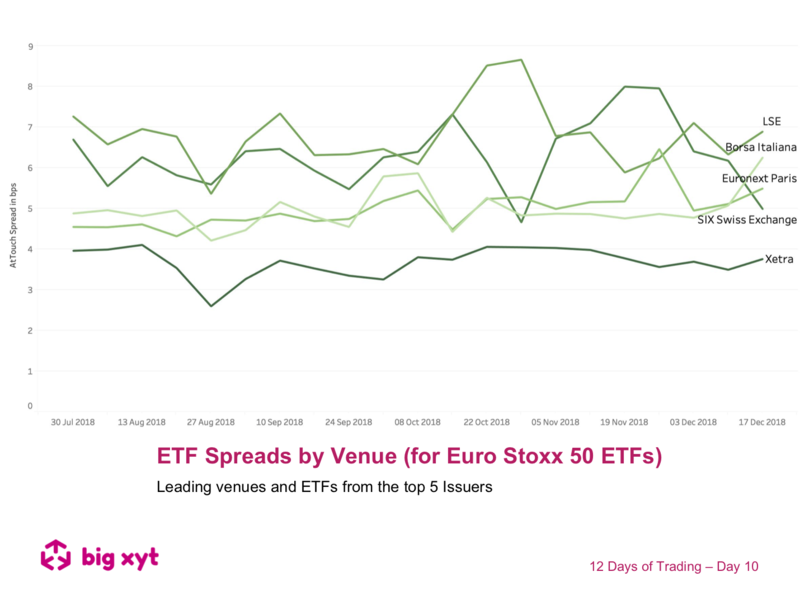 From our consolidated view of lit markets in ETFs, it is not surprising to see that At Touch Spreads vary by venue. There was observed impact of MiFID II with a new tick size regime and an increasingly competitive market. The influence of macro-economic uncertainty on volatility during February 2018 and Q4 2018. Measuring the movement of mid point prices before and after the time of every execution allows us to see some interesting patterns emerge. Different execution mechanisms exhibit distinct trajectories. Pan European average reported volumes by Systematic Internalisers now total around €30bn, representing 30% of equity turnover. Day 5 of 12: As mentioned yesterday, block trading, represented by Large In Scale (LIS) executions, has been growing steadily over the last 2 years. Trading behaviour has adapted to seek out blocks and advances in technology have created better tools to identify and match block trading opportunities. 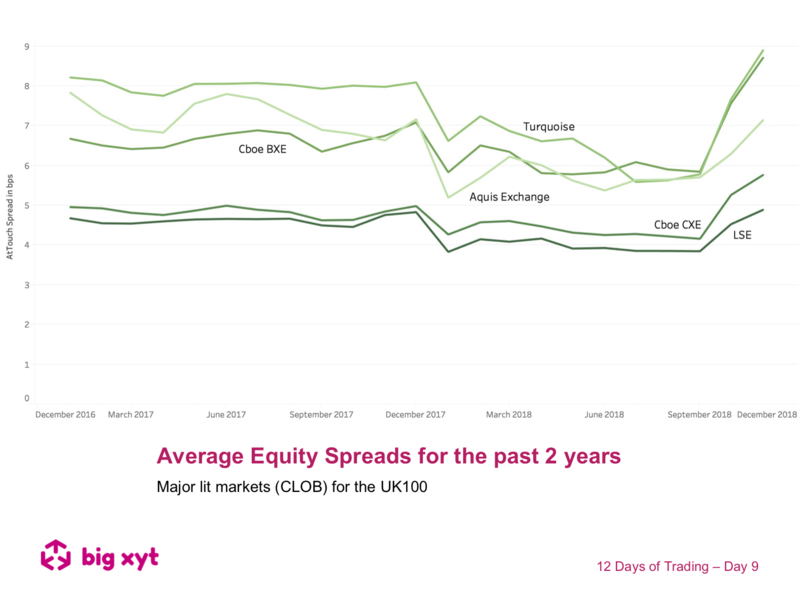 Day 4 of 12: In today’s view we take a look at some evolutionary themes in European Equity dark and block trading over the last 2 years. 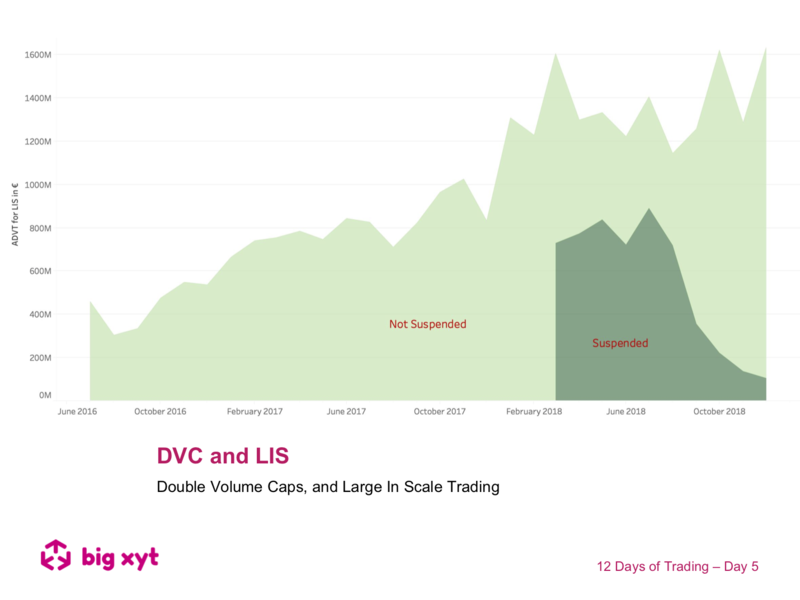 As expected, DVCs had an impact on dark traded volumes particularly in trades below Large In Scale (LIS). 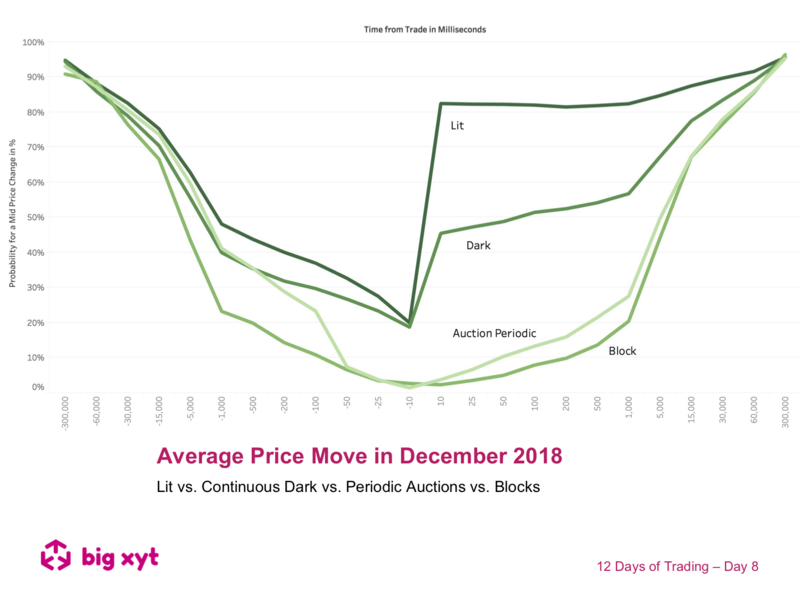 Day 3 of 12: Having looked at auction volumes in our previous view, we will now drill down into the two auction types that have seen increased use over the last year. 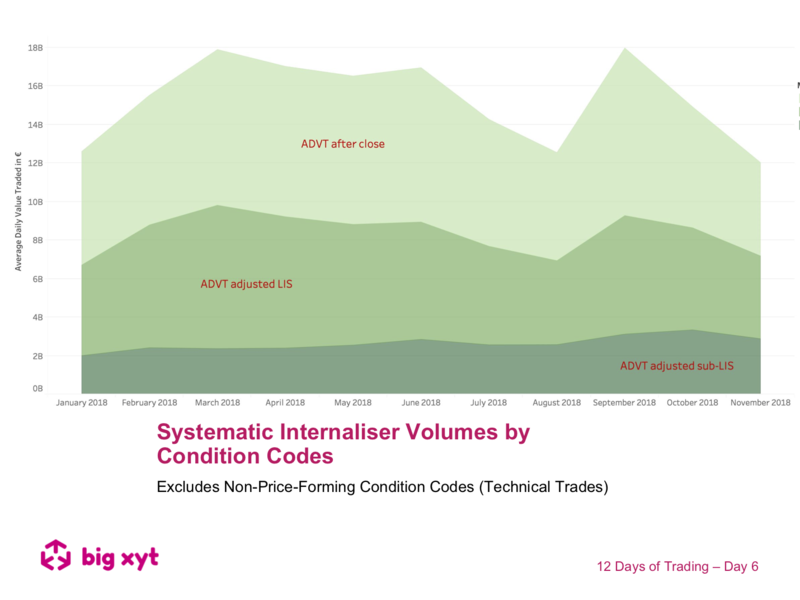 MiFID II was a catalyst for Periodic Auction use and the introduction of Double Volume Cap suspensions resulted in further acceleration.